Belling cookers combine the latest in cooking technology with stylish design and affordable prices. From simple stoves to large range cookers, with gas, electric and ceramic options, there’s something for every home. For those living a busy life, a Belling cooker with a “cook-to-off” setting will enable you to set the timer to turn off at a precise time. The beauty of the cook-to-off function is the ability to have dinner ready for when you get home, having set it before leaving the house that day safe in the knowledge that it’ll turn itself back off once it’s done. Need to pop to the shops for that forgotten dinner party dessert? The cook-to-off timer on the Belling cooker is perfect for that too, ensuring your food won’t be overdone. 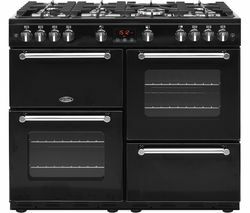 Belling Electric Cookers start at under £200 for a tabletop cooker with a single oven and two hobs, which is perfect for second kitchens or those looking for extra cooking space alongside a regular oven. 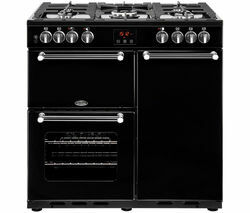 Despite being compact, these Belling cookers are deceptively spacious with enough room for a 12lb Turkey! Perfect for extra cooking space for the all important Christmas day feast! If you’ve got a big enough kitchen and regularly cook large meals, a Belling range cooker will do the job whilst looking great. You can even get up to 7 hobs for the ultimate cooking experience! For an alternative, check out our selection of Hotpoint Cookers, which come with easy to clean oven liners and also offer great value for money.